Full Throttle is about making Asker a fully implemented Cycle City. The local bicycle network i s expanded into a continuous grid of cycle friendly lanes connecting important destinations, with particular emphasis on shortcuts. Car traffic in the inner city is suggest reduced, and we propose a speed limit of max 30 km/h. The strategic proposal also include concrete punctual interventions, like allowing two-way cycling on one-way streets, dedicated bicycle tracts in roundabouts and a shuttle bus that brings commuter cyclists up the steep hill of the station. A Velostrada between Oslo and Asker along E18 makes for a hight speed direct route, with eavingn out the difference in hight (through bridges when necessary) and protect cyclist from dangerous situations. The Velostrada connects directly to the station, with a new bicycle parking facility that makes shifts between train and bicycle quick and easy. 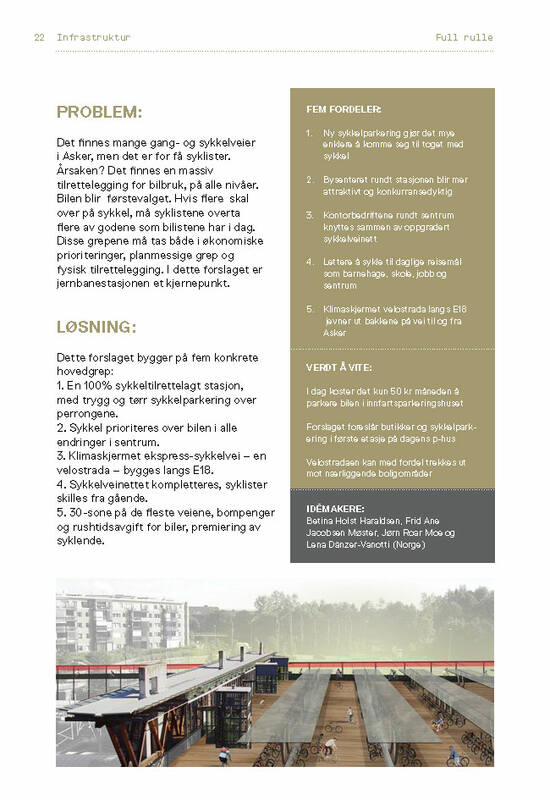 Full Throttle Asker was awarded 2nd place in the International Future Built Competition Get a bike - Break Free, and was subsequently published in Future Built Tool Book of Bicycle Strategies, and implemented as a leading document for bike-friendly development in the city of Asker.